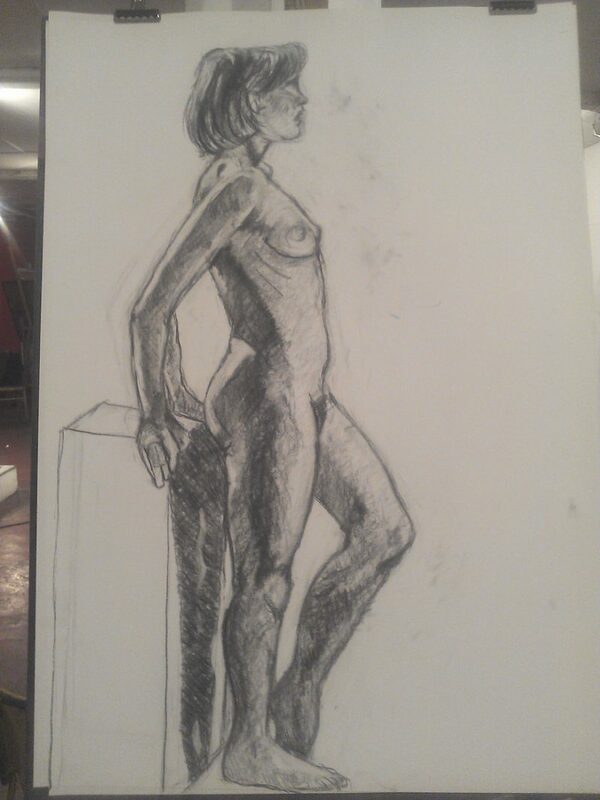 Do you go to life drawing classes? 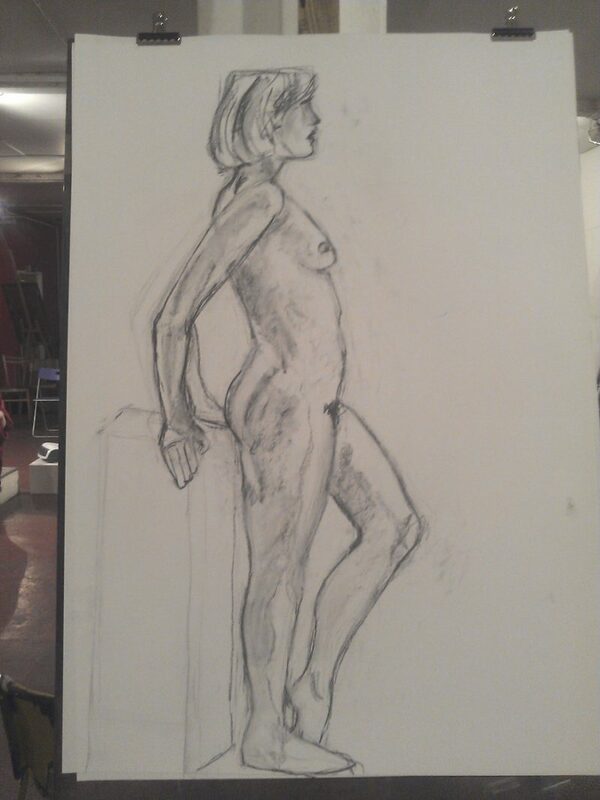 Do you whack up your easel then do sketch after perfect sketch, body angles lined up, limbs foreshortened and everything the size it should be? Or do you, like me, find yourself rubbing bits out because that shoulder is two degrees higher than the other and now your whole drawing’s out? You’re not alone. While I was earning relatively good money in London many years back, one of the things I decided to invest in was my art skills. Improving my life drawing enables me to feel more like a “real artist” and there’s a part of me that thinks I’m cheating otherwise. To be frank, I struggle a bit with life drawing and I often dread going to classes. I’m sure I’ll be surrounded by experts who create works they could stick up on Artfinder as soon as the ink’s dry. No doubt it’s partly because I came to art relatively late in my life, therefore didn’t learn to draw from observation at school. Therefore I’m getting to grip with the sketching the human figure. And I’m enjoying the challenge! Hmmm. I do tend to feel a bit overwhelmed with a blank sheet in front of me. Where to start? 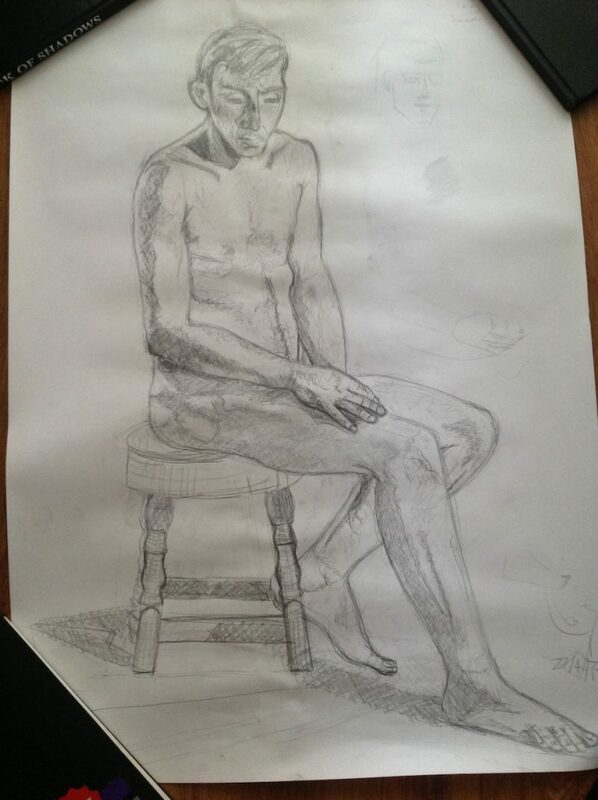 In the past few years of life drawing I’ve learnt not to focus too much one one area too soon. It’s probably common sense not to do this and to get the figure down correctly first, but it’s tempting to concentrate on an area and build up some fine detail. Only to find you need to move that leg up a centimetre or the whole piece is out of proportion. Bang goes all that lovely shading! 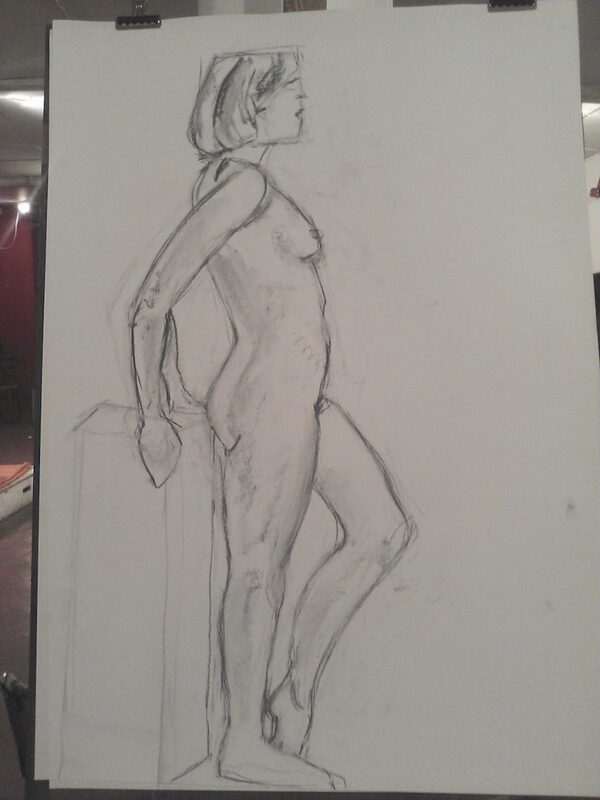 The sketches above were from my first life drawing class after many years. I worked hard to get the proportions of the model correct first of all. I opted for charcoal as it’s easy to go over any errors, plus great for contrasting light and dark areas. 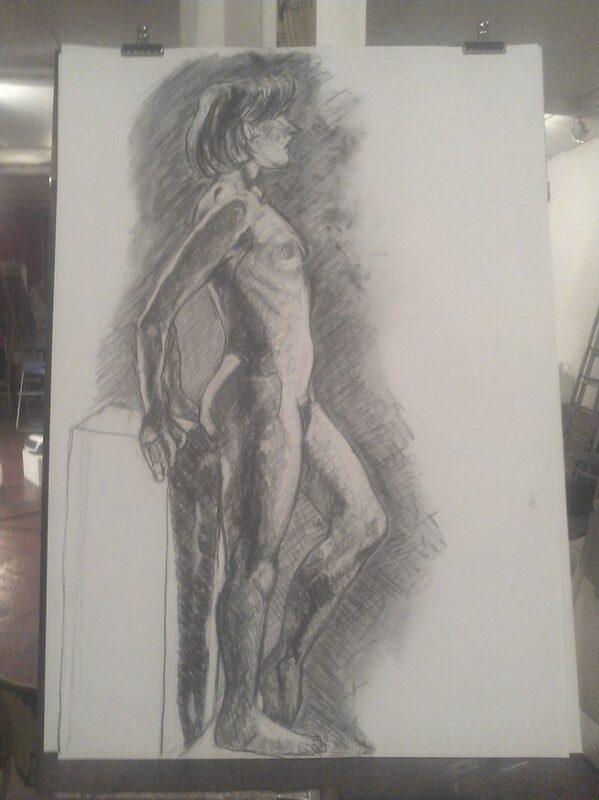 for defining muscle tone is a fantastic medium to draw with and you’ll have an effective piece of work to take home. Try highlighting places where the light hots with white chalk or pastel. You’ll be spoilt for choice in London and will certainly be able to google an interesting class near you. And if I were still in London I’d definitely try these two. No doubt I’ll still get the chance on a future visit south. My particular favourite is Candid Arts in Islington, especially as there’s a great cafe in the building (and great tutors!). When I was relatively well-paid I would go to all-day Saturday classes once a month. 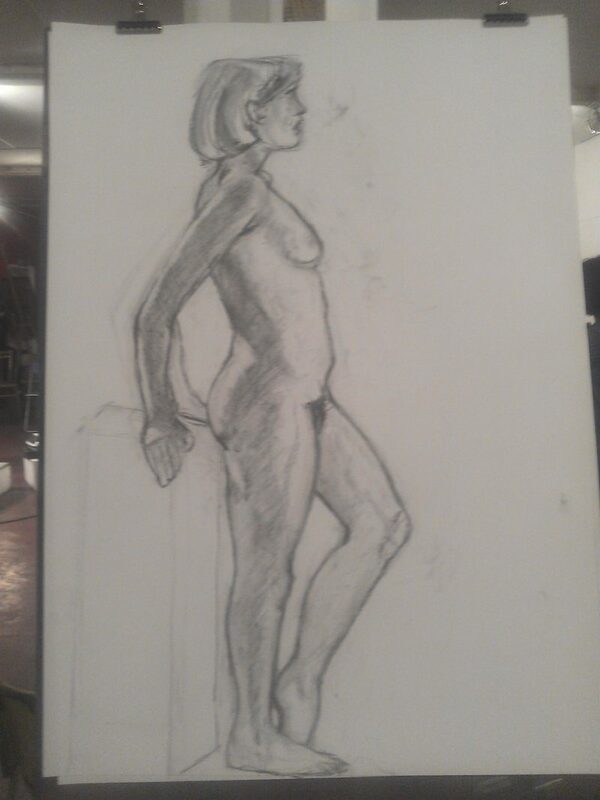 I enjoyed that the classes comprised of one single pose for the day, hence you could really develop a piece. All the sketches you see here were all from classes run by a teacher named Luca Indraccolo. And we were all a bit blown away by his work when he showed us photos on his phone! Luca started each class by a quick demo and then it was down to us. I enjoyed his teaching style a lot. Throughout the class, he was on hand to make suggestions and point out what our eyes couldn’t see (mine at least!). I’d certainly say I grew in confidence each time I went. Looking at these (not so great quality) photos that I took on my old phone, I can see there’s still work I need to do. Although I was happy with the work above overall, it took another artist to point something which is now glaringly obvious. The poor woman’s head is too flat! That said, I’m certainly not unhappy with my work as it’s an incentive to do better next time. In addition, I’m glad that I kept a record of the build-up to the finished life drawing. I mentioned to another class member that I was planning to correct a few thing once I got home. I’m glad that she persuaded me to leave it as it was since I can look back now and see how far I’ve come. Yyyep, one week the planets all lined up 😉 . The angles complemented each other, the feet were where I put them, the shadows fell where they should have. And it looked like the model. I was very happy with the work I did and what’s more so was the tutor who told me that it made his day when a student left with a great drawing. There’s still work to do, but I’m happily over the hump in the road and back in the world of drawing. 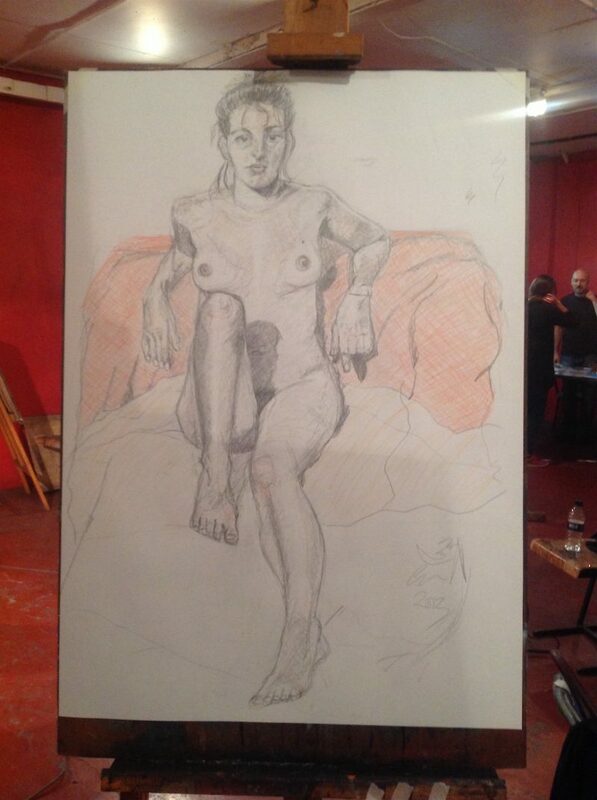 Stay tuned for a further adventure in life drawing when I’ll be discussing my classes in Glasgow. Go to a smallish class when you’re learning so you have some ongoing feedback from your tutor. Book and pay in advance so there’s less reason not to go on the day. Take time to look at your classmates’ work and see what you can learn. Don’t compare your work unfavourably to your neighbour’s. They may have a natural ability or had plenty of practice. You’ll get there! Prepare yourself for constructive feedback and don’t be afraid to offer it in return. Start off with charcoal – it’s very forgiving as you easily draw over your errors and rub them out easily. Save yourself a couple of bob and spray it with hairspray if you can’t get hold of fixative. Vary where you sit/stand each class. If you usually sit to sketch try standing next time. Pencil is fantastic for detailed work. Take an HB, 2H, 4H, 2B and a 4B to class so you have a mixture of densities for line and shading. Or raid your kids’ pencil cases for a couple of decent HBs for now. "Handmade Mirrors: Order from my Etsy store"